^ China won, but never wanted, Sino-Indian war - Global Times 互联网档案馆的存檔，存档日期23 September 2016. ^ India lost war with China but won Arunachal's heart - Times of India 互联网档案馆的存檔，存档日期30 November 2016. ^ 4.0 4.1 John W. Garver. China's Decision for War with India in 1962 (PDF). Indian Strategic Knowledge on Line. [2017-07-25]. （原始内容 (PDF)存档于2009-03-26）. ^ Eric S. Margolis. War at the Top of the World: The Struggle for Afghanistan, Kashmir, and Tibet. : 234. ^ 7.0 7.1 Laurie Burkitt; Andrew Scobell; Larry M. Wortzel. THE LESSONS OF HISTORY: THE CHINESE PEOPLE’S LIBERATION ARMY AT 75 (PDF). Strategic Studies Institute. 2003-07 [2017-07-25]. ISBN 1-58487-126-1. ^ Malik, V. P. Kargil from Surprise to Victory paperback. HarperCollins Publishers India. 2010: 343. ISBN 9789350293133. ^ Mark A. Ryan; David Michael Finkelstein; Michael A. McDevitt. Chinese Warfighting: The PLA Experience Since 1949. M.E. Sharpe. 2003: 188. ISBN 978-0-7656-1087-4. ^ L.N. Subramanian. The Battle of Chushul. [2017-07-25]. （原始内容存档于2001-02-09）. ^ 王宏纬. 1962年边界战争及其对中印关系的影响. 南亚研究. 2002, (2). ^ 12.0 12.1 12.2 12.3 12.4 12.5 王栋：论1962年中印边境冲突与中美关系. 国际政治研究. 2016, (03) [2017-07-25]. ^ Alfred P. Rubin. The Sino-Indian Border Disputes. The International and Comparative Law Quarterly. 1960-01, 9 (1): 96–125. ^ Maxwell, Neville. Settlements and Disputes: China's Approach to Territorial Issues (PDF). Economic and Political Weekly. 2006-09-09, 41 (36): 3876 [2006-09-29]. （原始内容 (PDF)存档于2006-10-01）. ^ Mohan Guruswamy. The Great India-China Game. The Rediff Special. 2003-06-23 [2017-07-25]. ^ Woodman, Dorothy. Himalayan Frontiers. London: Barrie & Rockliff, The Cresset Press. 1969. ^ Muhammad Ali Siddiqi. COVER STORY: The Kashimir Dispute: 1947-2012 by A.G. Noorani. DAWN. 2014-06-15 [2017-07-25]. ^ A.G. Noorani. The Kashmir Dispute: 1947-2012. Karachi: Oxford University Press. : 550pp. ISBN 978-0-19-940018-8. ^ 康民军. 中印边界西段争议历史 争议地区总面积为3.3万平方公里. 凤凰网. 首都师范大学学报. 2012-10-18 [2017-07-25]. ^ 25.0 25.1 1962年中印战争：印度王牌部队为何一触即溃. 搜狐军事. 环球网. 2014-08-14 [2017-07-24]. ^ Indo-China War of 1962. GlobalSecurity.org. [2017-07-25]. ^ 中印边境战争 让毛泽东忍无可忍. 凤凰资讯. 2007-08-28 [2017-07-24]. ^ 中印之战，他一战击溃印军心理防线. 搜狐网. 2016-09-12 [2017-07-27]. ^ 中印西段边境：除巴里加斯外均在中国控制内. 凤凰网. 人民网. 2012-10-18 [2017-07-27]. 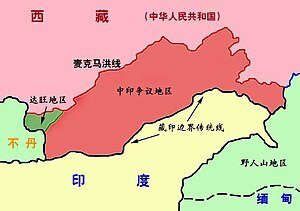 ^ 1962年对中印边境战争：解放军伤亡两千四百余人. 中国网. 2013-08-27 [2017-07-27]. （原始内容存档于2017年10月4日）. ^ 1962东线往事：混战邦迪拉. 凤凰大视野. 凤凰网. 2010-11-12 [2017-07-25]. ^ 中印自卫反击战内幕-中国军队撤军的真正原因. 中华网. 2007-12-26 [2017-07-24]. （原始内容存档于2017年8月2日）. ^ 中印战争双方伤亡人数曝光 张国华称33年不遇. 新浪军事. 新浪历史. 2014-08-26 [2017-07-26]. ^ James Barnard Calvin（美国海军中尉指挥官）. The China-India Border War. Marine Corps Command and Staff College. 1984-04 （英语）. ^ 1962年被俘印军士兵不想走？中国军队把他们当亲人. 军情突击手. 2017-07-05 [2017-07-27]. ^ 阿鲁纳恰尔邦. 搜狐新闻. 新华网. 2007-05-28 [2017-07-27]. ^ 中国拒向阿鲁纳恰尔邦官员发签证 印度自取其辱. 中国经济网. [2017-07-27]. ^ 周恩来. 关于中印边境自卫反击战的十个问题. 周恩来军事文选 第四册. ^ 50.0 50.1 50.2 亚洲国家（地区）与中国的关系 下册（东南亚）. 1965-05: 33. ^ History of the Conflict with China, 1962. P.B. Sinha, A.A. Athale, with S.N. Prasad, chief editor, History Division, Ministry of Defence, Govt. of India, 1992. ^ Maxwell, Neville. India's China War. New York: Pantheon. 1970 [2011-10-17]. ^ Ralph J. Retzlaff. India: A Year of Stability and Change. Asian Survey. 1963-02, 3 (2): 96-106. ^ Neville Maxwell. India's China War. London: Jonathan Cape Ltd. 1970. ISBN 978-0-394-47051-1. ^ 唐文. 唐文：战胜印军收复藏南反而撤军 中共“让世界目瞪口呆”. 阳关地带. 阿波罗新闻网. 2017-06-21 [2017-07-27]. ^ 金辉. 西藏墨脫的诱惑: 神秘奇险的高原边地之旅. 东方出版社. 1995: 102. ISBN 978-7-5060-0599-9. ^ 中共的“仁义之师”（下）. 华夏文摘 隧道. 1997, (8).